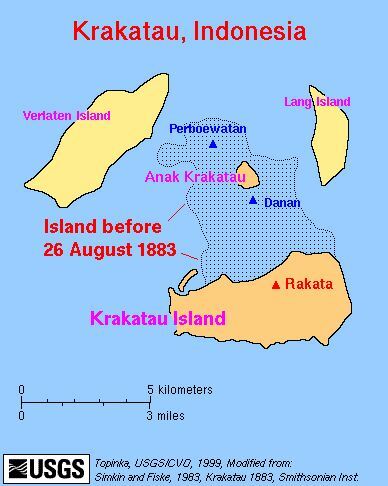 I’m in Java, Indonesia, filming a documentary on the 1883 eruption of Krakatoa – read part one and part two here. 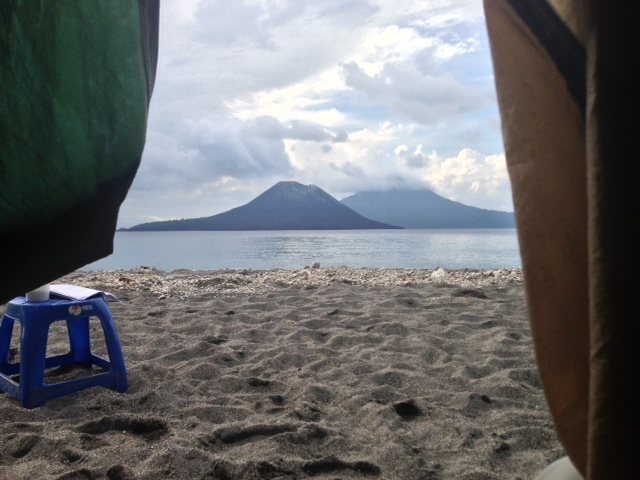 We have spent the last two days filming on and around Anak Krakatau. The boat ride out from the mainland takes about three hours, and we are accompanied by dolphins and the occasional flying fish. The approach to the islands on water is impressive, rounding the steep sided peak of Rakata – pretty much all that’s left of the pre-1883 Karakatoa. The two other peaks, Danan and Perboewatan, were destroyed in the eruption. Anak is active at present but not erupting, the last of the lava flows from the recent 2012 summit eruption no longer steaming. However fumarole activity is vigorous and we do not attempt a summit climb. 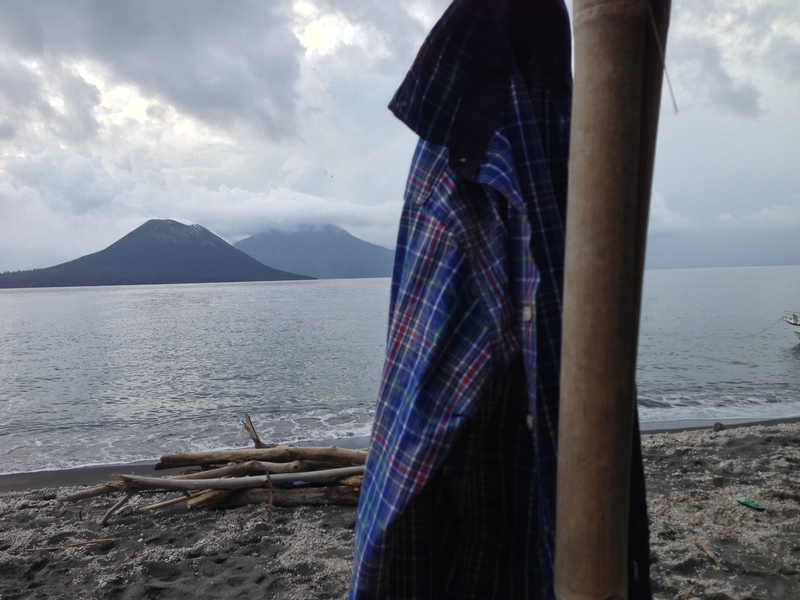 We set up camp for the night on the nearby island of Verlaten, overlooking Anak. The view from my tent is impressive. We are up with the sun to start work – mostly a succession of boat shots and frames for the CGI team, who plan to recreate the pre 1883 volcano in the background. The working title for the show is ‘Top Ten Natural Disasters’, and each event has a ‘guest ‘ slot with a presenter justifying why it deserves an entry. The 1906 San Francisco earthquake, the Great Plague and Hurricane Katrina are all in the mix. It is rainy season here, fiercely hot and humid. For the last two days I have, for continuity reasons, not been allowed to change shirt. Said shirt is simultaneously damp with sweat, sticky with suncream lotion and reeking of woodsmoke (if that sequence gets into the final edit you will see why). It could walk home by itself except I have to put it on again for the closing piece. Yet despite all this beauty, there is a depressing side. 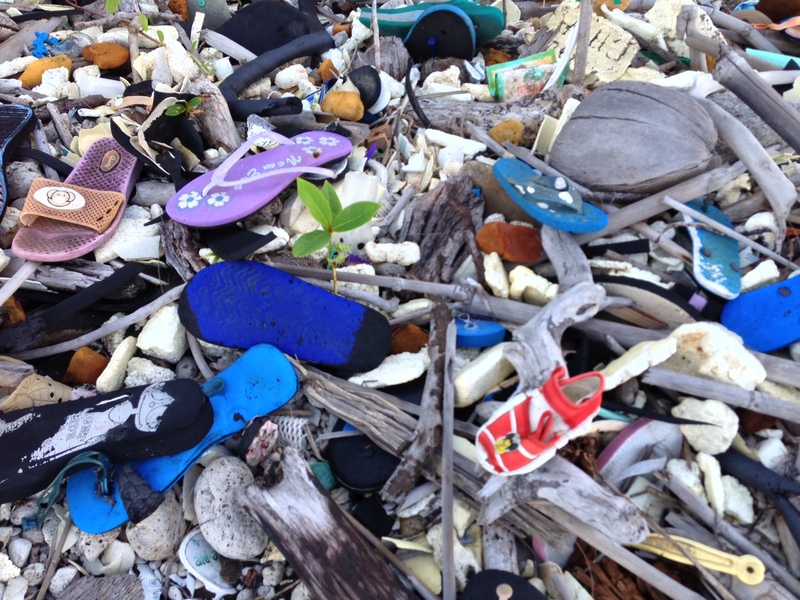 The shores are awash in places with rubbish, medicine bottles, plastics of all kinds (absurdly, individual oranges are sold in convenience stores here with their own fitted plastic bag), and, last but not least, a flip flop graveyard, hundreds of them in all colours and sizes. None of this trash would have been here in 1883, It’s a sobering reminder of the rapid environmental toll imposed by humans. I blame the Anthroprocene myself. Mind you, if there is a special place where flip flops go to die, then they couldn’t have picked a more stunning location. Tags: anak krakatau, eruption, filming, geology, hazards, history, islands, krakatoa, media, pioneer productions, volcanoes. Bookmark the permalink. Lots of those flip-flops look perfectly fit. Are you sure they;re dead, and not just taking a holiday and a rest from their partners? “Club 18-30” for flip-flops : what a horrible idea. I better guess would be more than a thousand. Having just visited on 12/23/15.